Florentia does not go to Rome, the Giallorossi win 3 to 1 thanks to the set pieces. The rossobianche they defend well and, especially in the second half, they play very well on the counterattack, but not enough to overcome a Roma, which with these three points, consolidates the fourth position in the Championship. Mister Carobbi chooses an atypical 4-3-3 to face Roma with Nencioni first toe and Rinaldi and Nocchi on the outside, in defense, as well as Filangeri and Ceci, for the first time in two years Elisabetta Tona is unable to recover. Even the Giallorossi have to do without several players, deploying the unprecedented defense Swaby-Corrado, 2002 class player from the safe future. Strong part of the Roma that at the first minute is immediately dangerous with Bonfantini, his left low shot from outside the area is strong, but easy for Marchitelli. along the far post, the ball overtook Marchitelli and Swaby is good at standing, stuffing the ball under the crossbar. The dangers for the Florentia always come from inactive ball, Marchitelli is amazing at 17 'on the header of Piedmont left guiltily free in the middle of the area. The Giallorossi maneuver the ball a lot, the Florentia defends well, but fails to start badly on the break. At the end of the first half there are two conclusions by Greggi and a normal administration for Marchitelli. In the second half is Florentia starting well with Nocchi that after just two minutes devours a goal in front of Pipitone kicking out of excellent position. The rossobianche, in their best moment, however, suffered the doubling of the Giallorossi: Bernauer scored directly from a corner, with Marchitelli unable to intervene for the foul of Piedmont not recognized by the Director of Race, which validates a network that seemed irregular. The rossobianche are pouring forward in search of the goal that could reopen the games and the network reaches the 66 'with Isotta Nocchi, the n.21 is good to fit between Swaby and Corrado on the beautiful launch of Rinaldi from the trocar and cold to kick in front of Pipitone, bagging his second goal in the Championship. The Florentia attacks on the wings of enthusiasm, but the landlords close well and the 88 'even find the third goal: Bartoli fits well into the penalty area in the midst of three defenders who landed, for the Director of Race is penalty kick, on the disk Martina Piemonte pulls strong and central and beats Marchitelli. The game ends with 3 in 1 for Roma, a result that is wider than those seen in the field today. A good test of the Florentia that is still moral in view of the clash next Saturday against a great Atalanta Mozzanica that once again stopped Juventus on a draw. 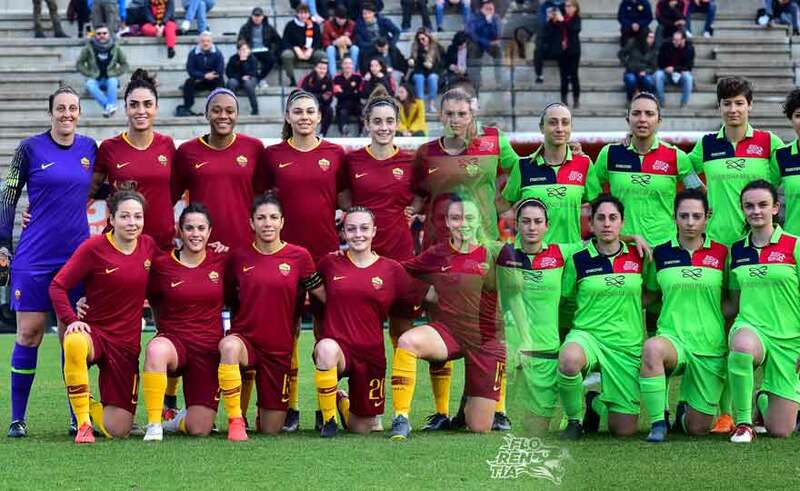 AS Roma Women: Pipitone, Soffia (85 'Labate), Corrado, Bartoli, Swaby, Simonetti (54' Antostoddeter), Greggi, Bernauer, Serturini (69 'Pugnali), Bonfantini, Piedmont.